Now that the S&P 500 has broken above 1400, we will be looking to see if the index can hold its gains and build on them. Many technical analysts believe that piercing this level makes a significant move upward very likely. There is a vocal camp that takes the opposite position. Based on the economic backdrop, this group thinks that we deserve to be deeper in bear market territory. Though the worst of the credit crunch may be behind us, these bears say that there is plenty more bad news out there waiting for investors. It is a fact that whole industries are in bear markets of their own right now though the stock market and economy as a whole has managed to avoid that state. It is clear that financial companies, despite the rebound in their stock prices, are undergoing a severe contraction. Airlines are going bankrupt left and right. Homebuilders, though it looks like their stocks have bounced lately, are still caught in a situation where the demand for their product, new housing, is practically non-existent in many parts of the country. We could see similar action in commodity-related companies if it turns out we are witnessing a bubble bursting in that sector. As we review various surveys and government reports, certainly the news is not particularly bright. On the other hand, it is not getting any worse. The various manufacturing surveys show that sector is still in contraction, just barely, but that the amount of contraction has not increased. It is the same with durable goods. The numbers are certainly not great but they haven't fallen off a cliff yet. In both cases, strength in exports has supported activity in the manufacturing sector and provided a floor under the numbers. We see the same kind of pattern in the employment and unemployment numbers. The layoffs are coming from the industries mentioned above that are in bear markets of their own. The remainder of the economy continues to more or less tread water. This past Friday's Non-Farm Payrolls report indicated the economy lost 20,000 jobs. This is nothing to brag about but it sure beats the loss of 85,000 jobs many economists expected would be reported. The Fed has just reduced rates by a quarter point and has hinted that it may pause. The markets have taken a schizophrenic reaction to this news. Commodity stocks have fallen on the assumption that the dollar will rise, making commodities themselves less expensive in dollar terms. Stocks rallied based on the belief the Fed will cut again if necessary but in the mean time the rising dollar will lower gas and food prices for struggling consumers. Let us not forget, however, the rising dollar will hurt those manufacturers who are dependent on growth in exports. As can be seen, we plot six different indicators and four are moving in a direction that indicates continued strength in the market. The other two are registering increased selling and distribution. We continue to see more stocks whose prices are rising above their moving averages. The number of stocks trading above their 20-day moving average has increased again to about 4670. The number of stocks trading above their 50-day moving average has increased to about 4445. What worries me about these two indicators is that the rate of increase has slowed down and, in the case of the 20-day MA, we still have not exceeded the peak reached one month ago. What is more encouraging is that the number of stocks whose 20-day moving average has made a bullish cross-over above their 50-day moving average has continued increasing at the same rate we have seen for six straight weeks now. All told, the moving average analysis shows that the majority of stocks continue to make gains and that the major market averages are not rising solely as the result of a few big bellwethers. On the other hand, it looks like the gains in many stocks may be moderating as the 20-day MA statistics begin to slow. We see on the chart above that our remaining indicators are painting a mixed picture. The Aroon analysis shows stocks in strong up-trends or down-trends. The chart shows the number of stocks found to be in strong up-trends has increased again. However, we also see that the number of stocks determined to be in a strong down-trend is also increasing. We also plot the results of Chaikin Money Flow analysis. The number of stocks undergoing strong accumulation or buying has declined from about 1180 last week to 850 this week. Not shown on the chart is the number of stocks shown to be undergoing strong distribution or selling. This indicator has increased, with the number of stocks in this category jumping from 480 to 580. It appears that these two indicators are telling us a somewhat different story than the moving averages. The next chart to review is that of the SPDR S&P 500 ETF (SPY). As discussed last week, we were on the verge of breaking through resistance (denoted by the horizontal line) and above the downward sloping trend line. This was indeed accomplished this past week. Skeptics would point out that volume was not especially heavy. Was this a significant breakout, then, one from which there will be no looking back? That was not quite proven last week. Nevertheless, this was a very positive development and bodes well for future gains. 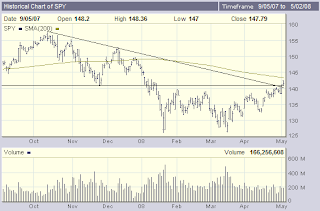 In the short term, SPY could do some backing and filling around the 140 level which should now act as support. Note that SPY is just below its 200-day moving average. This will probably provide another challenge as SPY at first fails to break through. With the old trendline now providing support though, I think it won't be long before we pierce the 200-day MA also. The economic backdrop remains less than ideal but at least the horrible news seems to be abating. Whether you believe the government numbers or not, things do seem to be less bad than they were. With respect to stock prices, markets will experience continuing economic headwinds as a moderating influence, preventing euphoria. Will it be the wall of worry the markets like to climb? Let's hope so. The market internals we track seem to be signaling the rally in stock prices is slowing down but not giving up. Given the number of stocks that are above their moving averages, however, it also seems that there is very broad-based strength in the market today. This should continue to mitigate against a significant drop in the major stock indexes. I believe the indicators such as Chaikin Money Flow and Aroon are showing two forces at work. First, the stocks that reported poor earnings are being punished. Secondly, there is some profit taking or selling into strength that is occurring. That is not unexpected as SPY, for example, has moved up over 11% since its March bottom. The most likely outcome over the short term is a new trading range developing. The market will need to digest the breakout we just saw and balance the desire to drive prices higher with the realization the economy still has pockets of significant weakness. The breakout indicates to me that we will see higher prices but the indexes will not skyrocket. On the other hand, when the inevitable profit-taking kicks in, I don't believe we will see new lows. All told, it isn't a bad time to be long equities.